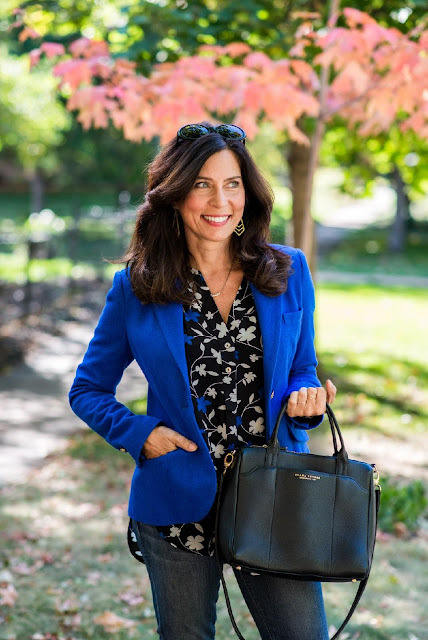 Adrienne of The Rich Life in Wine Country, my lovely “How I Wear My” partner, writes, “I don’t wear blazers very often and usually favor something less structured so I only have one in my closet. 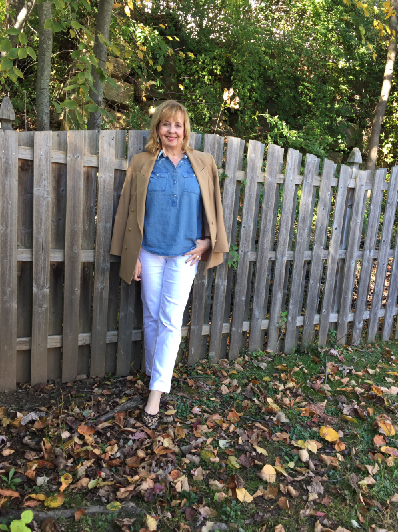 This blazer from Old Navy has a bit of stretch to it so I can push or roll the sleeves up and give it a more casual look. I wore my blazer with a white knit tank from Gap, black jeans and my ABEO booties I recently blogged about. I layered a long druzy necklace with a pearl and semi-precious stone necklace to add a bit of interest. 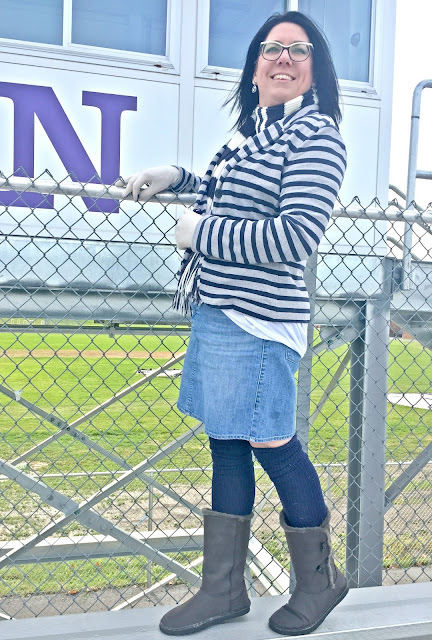 I topped my outfit off with a new wool hat from my favorite hat shop, Montecristi Panama Hats of Napa Valley, and carried my new Louis Vuitton Neverfull, a gift from my husband for my 50th birthday earlier this fall. 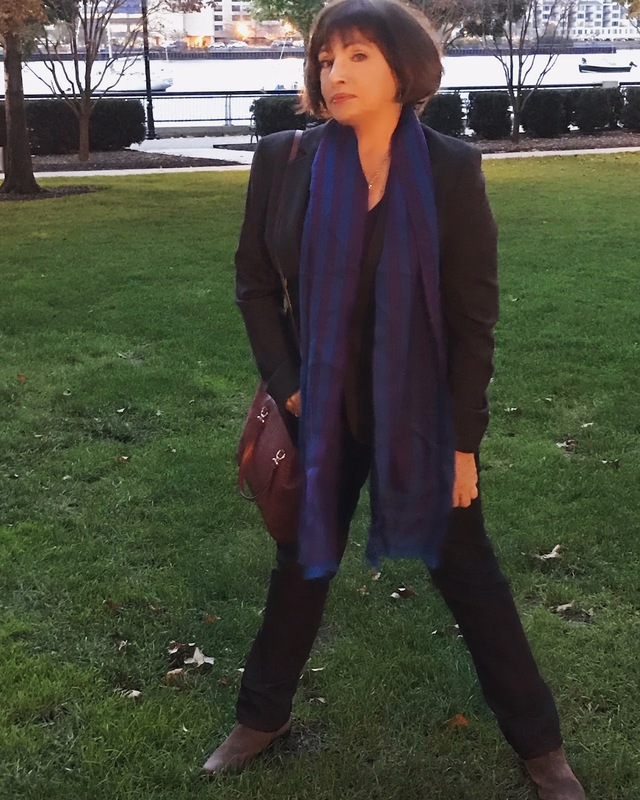 She is wearing a Theory tweed blazer with Lafayette jeans, an Alpaca striped scarf, Naot camel suede boots and carrying a Coach handbag. I love this shot of her, taken along the Hudson River! 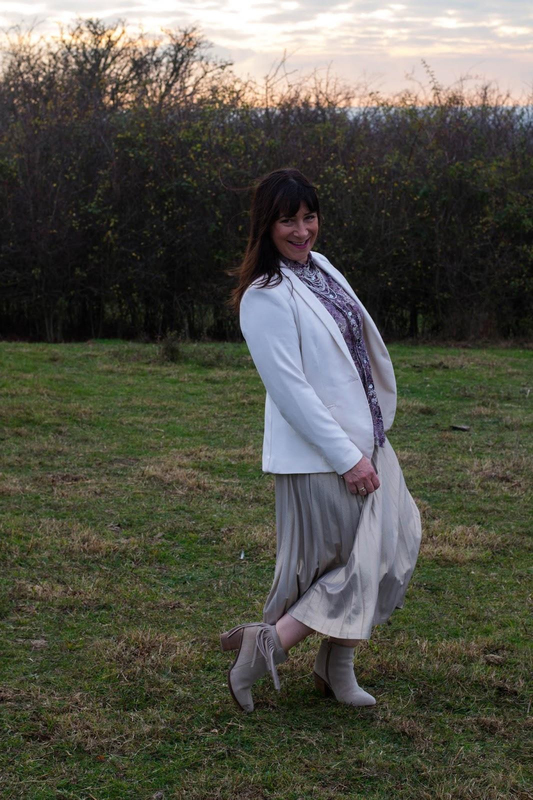 Jacqui of Mummabstylish says she wears her cream blazer in all seasons! Michelle of Michelle Tyler, left, and Lisa of The Sequinist, right. 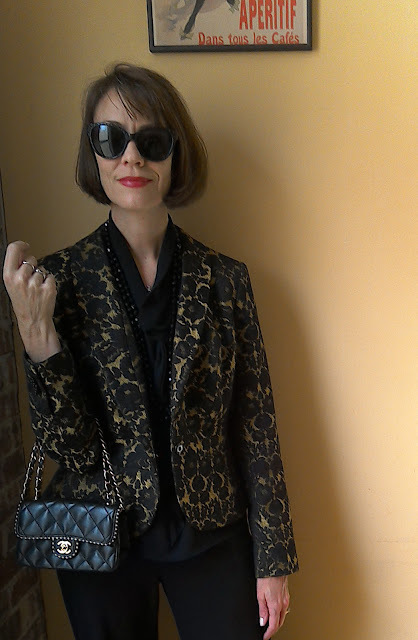 Annette of Lady of Style. 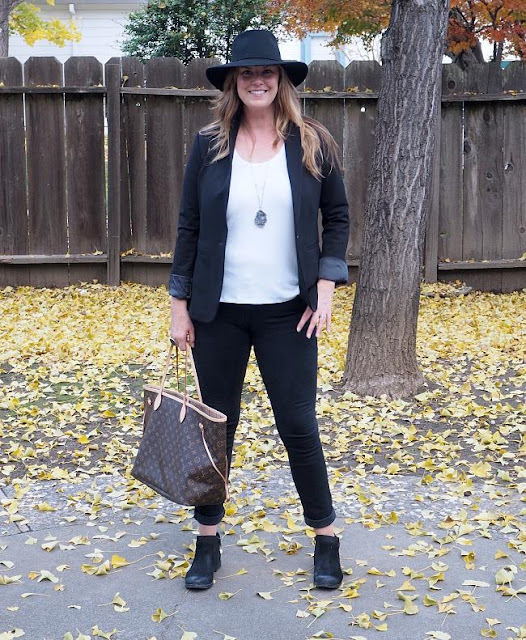 Annette of Lady of Style shared different ways that she styled a burgundy velvet blazer. 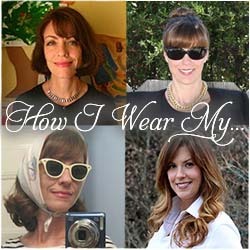 I love it both ways and if you would like to see it worn with a dress, be sure to visit Adrienne’s post! 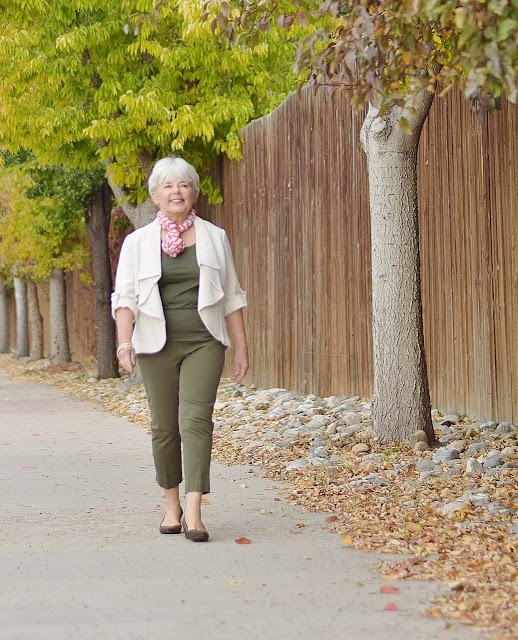 Another great look on Annette! Nancy of Jodie’s Touch of Style. Charlotte of Jodie’s Touch of Style. 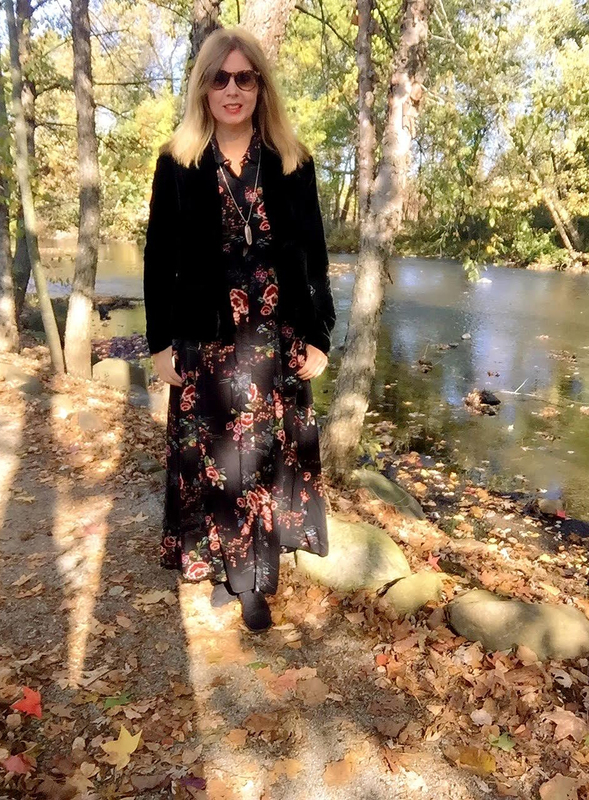 Michele of @seechele_styles wears a thrifted vintage black velvet jacket worn over a Zara floral dress. 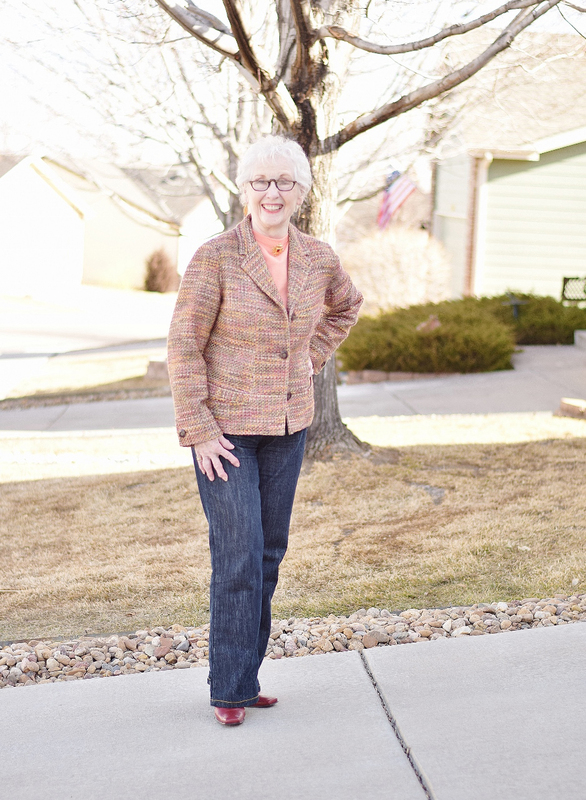 Suzanne of Suzanne Carillo says her plaid blazer is quite festive and I quite agree! I love that she paired it with a shiny pleated skirt. I don’t have that many blazers and I don’t wear them that much since I find them too confining. I do love my L’Wren Scott for Banana Republic blazer, which seems particularly nice in the holiday season, and I get a lot of wear out of it every December, whether it is with black pants or with jeans. I hope you are enjoying the season and wearing every blazer in your closet! After a lot of thought and discussion between us, Adrienne and I have decided to bring the “How I Wear My” series to a close after six (six!) amazing years. Speaking for myself, when we started this venture, all because we’d both bought the same Missoni for Target cardigan and thought it would be fun to show how we each wore it, I never dreamed I’d get to work, long-distance and for such an extended period of time, with someone as driven, intelligent, creative, disciplined, loving, funny, and beautiful as Adrienne. I am entirely in her debt. I have learned so much from her and I love her. Adrienne and I could never have kept “How I Wear My” alive all this time without the wonderful photos submitted by all you ladies (and sometimes gentleman) out there! I thank you for your stories and fashion inspiration and good humor and friendship. Working with all of you has buoyed me during a few tough times in my life over the past six years and I thank you so much. I am filled with gratitude for what you all have given me. So be doubly sure to stop by Adrienne’s post to see even more great looks featuring a blazer. And THANK YOU to all the fine foxes who participated this month, and any month, over the past six years! I've been having such a moment with blazers!!!!! Love everyone's look!!!!! While I’m saddened by the announcement, I’m very much appreciative of the time and effort you and Adrienne have devoted to this monthly feature. I’ve looked forward to seeing all the imaginative submissions by the many contributors to the series and the monthly prompts have served as inspirations for me. Thank you for your dedication to this series and good wishes to you. I hope that you have a joyous holiday season. Dear Jill - where do I begin? I am so grateful to you for your commitment to this series. Only you and I know how much work goes into these posts - I always called it a labor of fashion love. I am sad it's ending but also glad we stopped when we did - ending on a high note with a great post. I am also grateful for all the fabulous women and men who sent us photos over the years. What a wonderful assortment of looks we have compiled. Now the hard part will be making sure we stay in touch. HIWM made it easy to check in with each other every 2 or 3 weeks - we will have to do our best to not let too much time pass. Thank you again for your hard work, humor, dedication and fab style...one day we will meet in person, I just know! Many hugs to you, friend. Thanks so much for putting together this series for so many years ladies! I've enjoyed looking at everyone's submissions and often was inspired. Best wishes to you both and have a wonderful holiday season. As one of the sometimes gentleman to submit (lol) indeed I appreciate the hard work you put into this. It was always a pleasure to see all the fabulous looks that everyone submitted. It's been such a pleasure seeing all of these different perspectives every month. I'm so sorry it won't continue, but I totally understand!!! Dear Jill, it is a shame for us you both are going to stop these series, but it is totally understandable. Thank you so much for hosting it for such a long time. As usual you look very smart, you always do. It was a pleasure joining you evry month. I will link back to the both of you next Sunday. 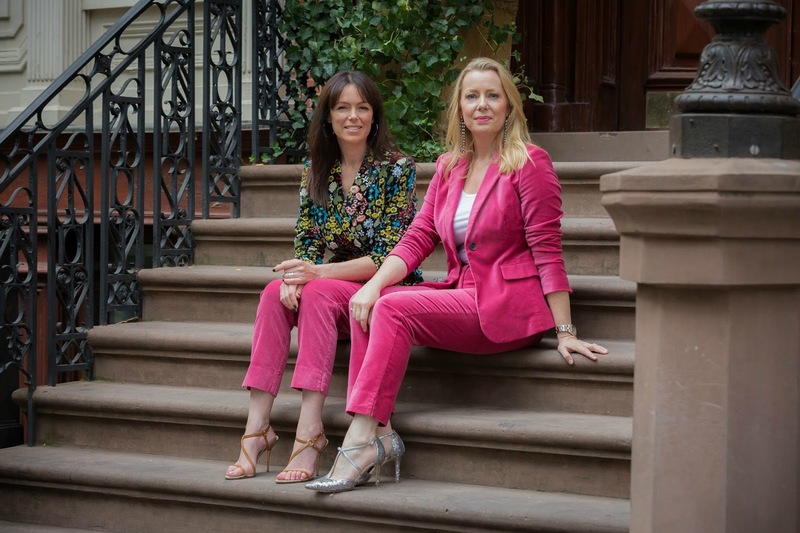 Jill, it has been such an honor and a pleasure to get to know you through this wonderful series that you and Adrienne have poured your hearts into! It is sad to see it end, but all great things must come to an end, at least that's what they say. 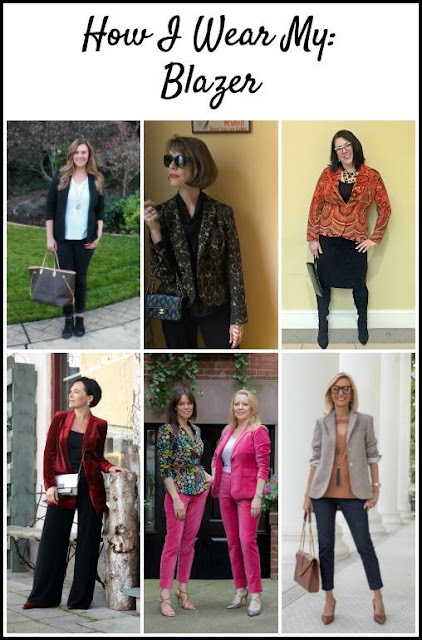 I have been inspired by so many fabulously stylish ladies through this series including yourself and Adrienne. All I can say is thank you so much for all of this! And your blazer is phenomenal and you have styled it perfectly as you always do! 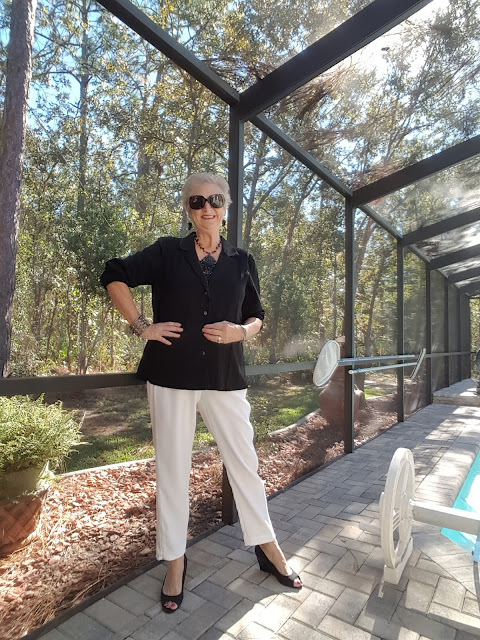 I will continue to visit your blog to see what's new and fabulous! Thank you again. I love your jacket, Jill! It is beautiful! Thanks for doing this...and I hope you are well!